P-Flex (PET substrate) can also be specially ordered with a waterproof grade resist coating. ◆ P-Flex (PET substrate) can also be specially ordered with a waterproof grade resist coating. ◆ It can also be used in parts that are prone to water intrusion such as equipment used outdoors or in-vehicle body electronics. 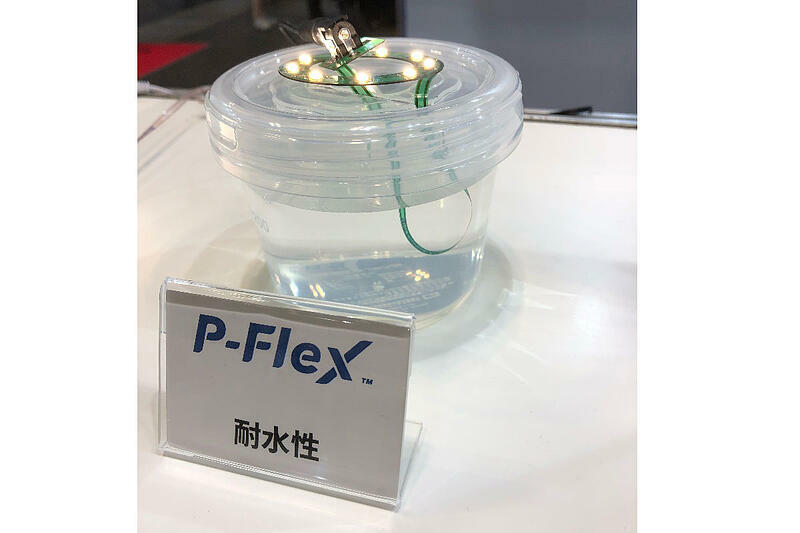 ◆ Using the water-resistant P-Flex can reduce manufacturing costs as there is no need to waterproof cables with sealing materials or taping. P-Flex™ is a single-face flex PCB manufactured using the Pure Additive™ method. Conventionally, electronic circuits have been manufactured by applying a method known as lithography, in which a thin metallic sheet is first applied to the board surface, and then unrequired sections are melted away. The Pure Additive™ method (*) developed by Elephantech is a concept completely opposite to what had been used until now, using a proprietary manufacturing technology that prints metal nanoparticles with inkjet only on the necessary parts and grows metals by electroless plating technology. By reducing the amount of metal, liquid waste and man-hours, we can lessen manufacturing costs and shorten the lead time. Elephantech will continue to reduce its environmental burden and contribute to the achievement of SDGs. Outline-pattern interval Standard : 0.5 mm min.High : 0.3 mm min. Panel size 180 × 270 mm max.